I cleaned my fridge on Sunday. Cleaning the fridge is one of those things I love to whine about and struggle to avoid procrastinating on, but once I get going I realize: a) it's not that hard, b) it doesn't take that long, and c) the benefits are way awesomer than any I might have gained from sitting on the couch watching football for an extra thirty minutes. 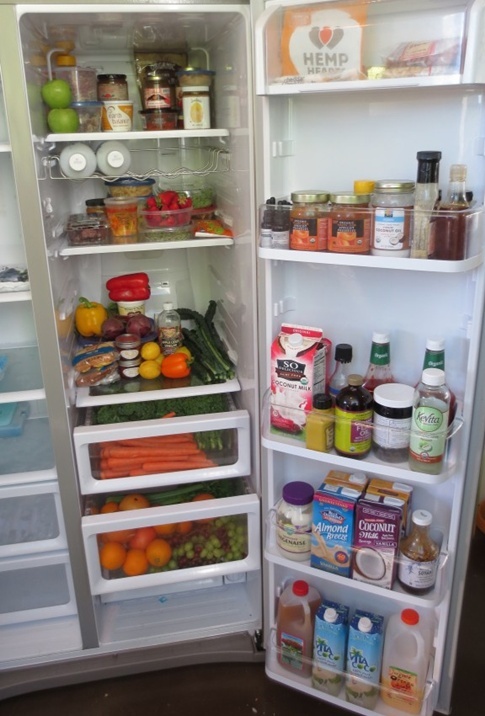 When was the last time you cleaned your fridge from top to bottom? Can't remember. Maybe you should do it now. If you just went grocery shopping you get a pass to wait until next week, but do it then. Here's how to clean a refrigerator the fast and green way. This isn't my fridge. It belongs to vegan iron man, Rich Roll and is part of Well + Good's Refrigerator Look Book Series. I'm pretty sure all their participants clean their fridge before W + G comes over. They're always so clean! Combine a tablespoon of baking soda with a quart of hot (not boiling) water in a small pail or big mixing bowl to make a cleaning solution. You could also use a small squirt of dish detergent instead. (Just make sure the water isn't sudsy.) I like to do both! Fill another bowl or pail with just hot water. Vacuum or dust the top exterior of fridge unit. If you are strong enough to move your fridge, vacuum the grates behind it and the floor under it too. Then wipe the top exterior with a cloth dipped in the cleaning solution. Then rub the cloth along the grooves of the rubber thing that holds the door closed. Using a sponge with a white (gentle) scrubby side dipped in the cleaning mixture, wipe down the inside of the freezer or fridge (whichever is on top). Decide if you'd like to start or end with the door, then start. Set out to work from top to bottom and from left to right, so you don't miss anything or spill stuff onto cleaned areas. Use scrubby side to get gunky messes cleaned faster. Tip: If your fridge isn't crammed with stuff, you can just slide items over onto an area you haven't cleaned yet. If bottles, jars, or other containers are icky, wipe them off too before putting them onto a cleaned area. Important: Squeeze sponge inside of bowl of plain water every now and then to rinse and refresh it before putting it into the bowl of cleaning solution. Repeat process in fridge or freezer, whichever is on the bottom. Did you remember to clean the space under the crisper? Just checking. Clean the outside front. Use a retired toothbrush dipped in a bit of the cleaning solution to get any gunk out from along the handle and screws. If the refrigerator is stainless steel, clean with a little bit of Bon Ami powder cleanser on the soft side of the sponge, going along the grain. Rinse well with water on the sponge, then dry really well with a soft towel, again going along the grain. Better Life makes a natural stainless steel cleanser that you can just spray, wipe, and buff. (I haven't tried it, but if it's anything like their other products, it's probably pretty fabulous.) If it's not stainless steel, lucky you! Just use the cleaning solution you've been using all along with a the cloth and don't worry about drying it. Write the date for three months from now on two open boxes of baking soda, and put one in the fridge and another in the freezer. This will be your reminder to both swap the boxes and clean out the fridge again in three months. If you already had boxes of baking soda in the fridge, save the old ones to use for unclogging your drains. Check out "Refridge Refresh- How to Detox Your Fridge" by Callie from Broccoli Cupcake for tips for purging unhealthy foods and introducing healthy treats to your fridge. More fun reading: 10 Ways to Green Your Fridge at Iowa Avenue blog. I know what i'm doing this weekend! We did behind and under the fridge and stove this past weekend, and it was nasty mcnasty. I recently read a similar trick for doing the stove too. Baking soda + water + $1 store scrubby brush with handle = clean stove with none of those nasty easy off fumes. Easy off doesn't work so easy either! My big fridge problem is crap getting stuck between the glass of the lower shelf and the crisper, the lip part where they meet. If i don't take that apart soon i may have a petri dish. Yuck! Thanks for the motivation Liv! Also, thanks for sharing your baking soda & stove tip.